Steven Hake is a professor of literature at Patrick Henry College and chairman of the Department of Classical Liberal Arts. He was the director of Rivendell Study Center in northern Pennsylvania for four years prior to coming to PHC. He was a tent-making missionary to Taiwan for almost 20 years prior to that (1977–1996), teaching English literature in a large Chinese university for most of that time. Dr. and Mrs. Hake have been married a long time, have nine children, and many grandchildren. They are veteran homeschoolers. Dr. Hake is an avid reader and enjoys learning languages as a hobby. He regularly reads (with widely varying degrees of fluency!) the Bible in ten languages. He is also an enthusiastic backpacker and sailor. He is praying for a Christian Renaissance, and believes that we need to read the great books in order that we may write them. He is also praying that God will bless Patrick Henry College with a culture of discipleship, disciple making, and outreach to our neighbors locally. 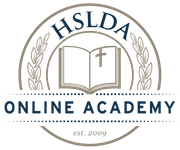 Dr. Hake has worked with HSLDA Online Academy since 2009.